roll it, season with topping and cheese. Cut into slices and bake them. Combine the sieve flour and salt in a large bowl. Take warm water in separate bowl and add sugar and yeast. Keep aside for 10 minutes to foam up. Add the yeast water into flour and make soft dough gently. Apply olive oil and cover it. dough again. Add extra flour if needed. Now your dough is ready to use. spread the pizza sauce or ketchup. or as wrap. Cut into equal size of slices. Serve hot with extra seasoning or ketchup. Always try to use olive oil for better taste. vegetable in topping whatever is available or you like it. You can keep leftover dough in freeze for further use. pizza sauce, plain flour recipes, fermented recipes. how it turned out in the comments below. I love these pinwheels, they make me drool. I had made these some time back for one of the marathons and we simply loved these as bitings. great clicks Preeti. Pizza in pinwheel shape has turned out perfect Preeti. Looks so yum.. Perfectly baked. Nice combination of toppings. My girls love pinwheels. They looks so delicious. Just love pinwheel pizza.. So tempting they are. what pretty pinwheels – great to serve at parties! I love this pinwheel pizza, yours has turned out so good! I've made these pinwheels are can vouch that they are so delicious.Its great as party food and also for kids lunch boxes. The pinwheel look absolutely delicious. They are baked to the perfection and these could be best party appetizers too. 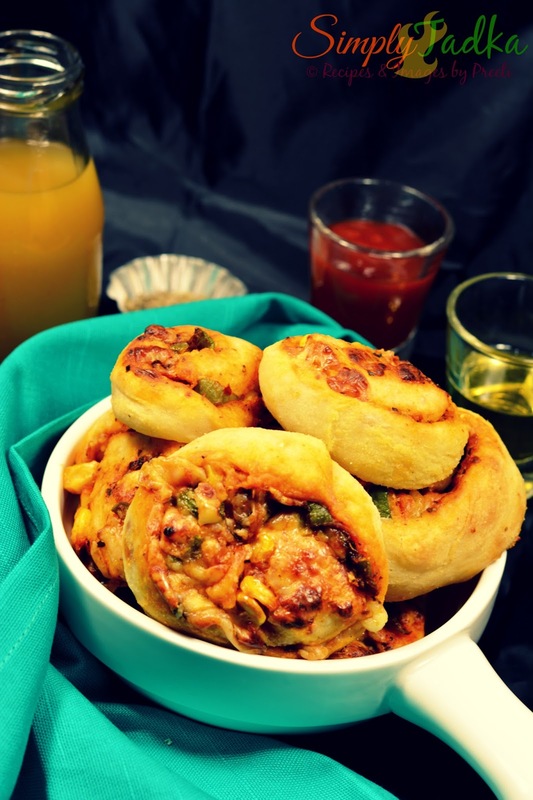 My sonny boy loves pizza and I am sure he would love these pizza pinwheeles too , they look so tempting even I am tempted to grab one and enjoy, thanks for sharing will try soon. 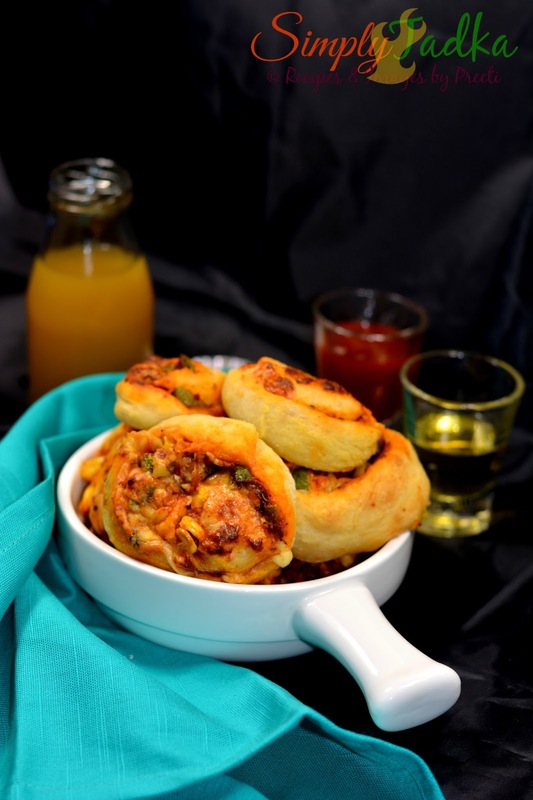 Pizza pinwheels are a hit at kids birthday parties..they make for perfect starter dish..yours looks perfectly baked and the toppings sound flavorful ! Ohh I love this pinwheel. Whenever I prepare pizza these pinwheels are must to be added 😉 Awesome share !!! These look so lovely and ideal for a weekend treat. Lovely share. I love the fact fact that making this can be made in different shape for kids. Love the way pinwheels came out, looks so so tempting. I love these pinwheels pizza. Very interesting and delicious recipe. YUMMY! Pizza pinwheel looks so delicious and tempting. A perfect weekend snack to binge on. Great recipe! Pizza 🍕 pinwheels are loved by our whole family. Yours look so inviting. Pizza pinwheel looks so cute. Perfect for kids party. Loved your simple yet delicious recipe. Next time I will try it instead of regular pizza. Thanks for the recipe.